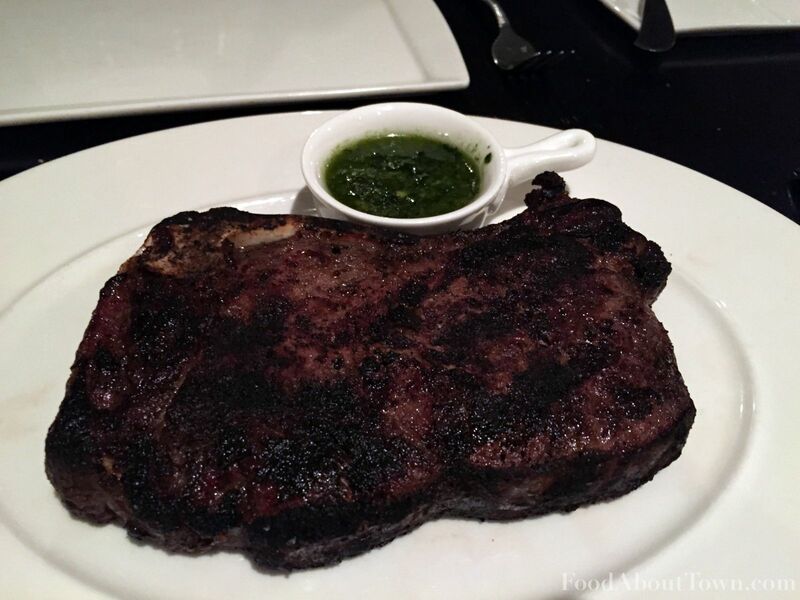 This is a repost of my recent City Newspaper review of Char Steak & Lounge at the Strathallen. I enjoyed both of the meals we had at Char and was happy to get back into the steak game since I don’t eat steak that often. A class act from top to bottom and a solid piece in the Josh and Jenna Miles portfolio of restaurants they run in the WNY area that include The Revelry, Branca in Bushnell’s Basin and the fantastic Buffalo Proper. Char, the upscale steakhouse located in the recently remodeled Strathallan Hotel, and as the name implies, is all about wood-fire charred goodies and especially their steaks. For the skim-reading steak fanatics who want to know whether or not the steak was good, I’ll get it out of the way first: Yes, it was. With that being said, I’ll save the steak details for later and focus on the restaurant’s other aspects. Although Char has the feel of a big-city hotel steakhouse, it is accessible to anyone who wants to eat a solid meal. The restaurant offers a classy environment as well as solid food at multiple price points. I enjoyed the contemporary styling that included faux stone facades and multiple fire elements along with a snazzy bar area; this is the kind of place that can accommodate a business meet-up or a romantic dinner with no issues. Char has professional service all-around, from the hosts to the attentive wait staff and even the sous chef, who showed off the restaurant’s beautiful J&R Woodshow Broiler to me following the meal. As I mentioned, dining at Char doesn’t have to be a wallet emptying experience, especially if you stop in during lunch time. Going to a restaurant for lunch is a great way to experience its food in a slightly more casual way and is one of my favorite methods to keep from breaking the bank. 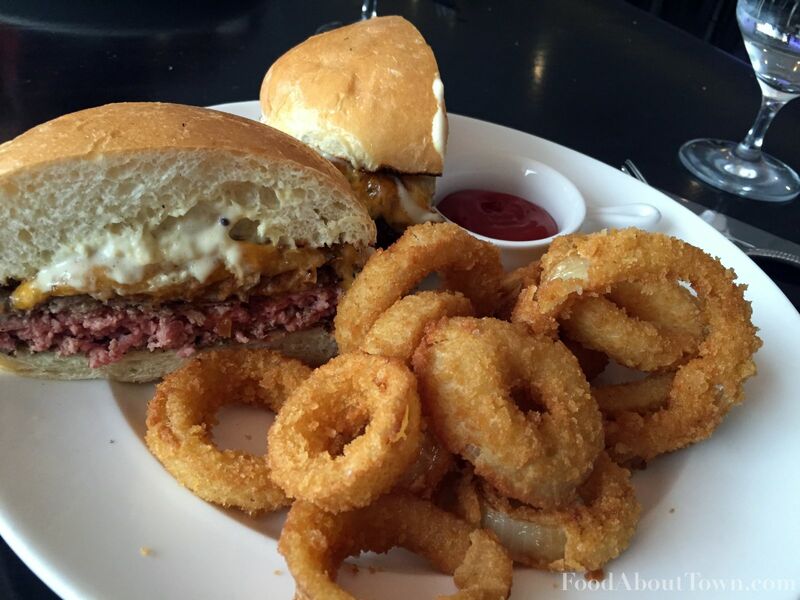 The prime sirloin burger (8-ounce for $14, 12-ounce for $17) was cooked, as ordered, to medium rare, and thanks to being coarsely ground in house, it maintained some of that steak-like characteristic I look for in a high-end burger. The onion and bacon jam brought a salty-sweet dimension — the only thing I’d do would be to add some sort of pickled item to cut through what turns out to be a rich burger. Despite that, this is one of the finest burgers in Rochester and one well worth hunting down. 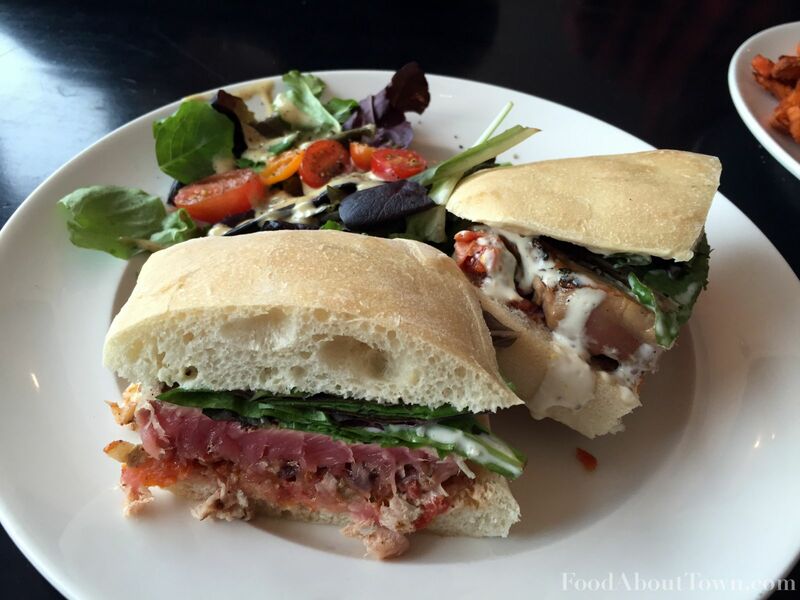 The biggest surprise for me was the grilled yellowfin tuna sandwich ($14 with a salad) which turned out to be my favorite dish of either of my visits. The smoke from the wood fired grill, paired with the clean, rare tuna and brightness of the lemon, made for an addictive combination that left my palate wanting more. The sliced pork loin sandwich ($12) offered moist meat that was well-salted but would have benefitted from more of the giardiniera relish to liven things up. The dressing on the chicken Caesar salad ($8, plus $6 for 8-ounce chicken) had good depth but was overly heavy and desperately needed a solid squeeze of lemon. For dinner, my wife and I ordered mostly old-school steakhouse fare to see how the classics measured up and what twists Char had in store for us. 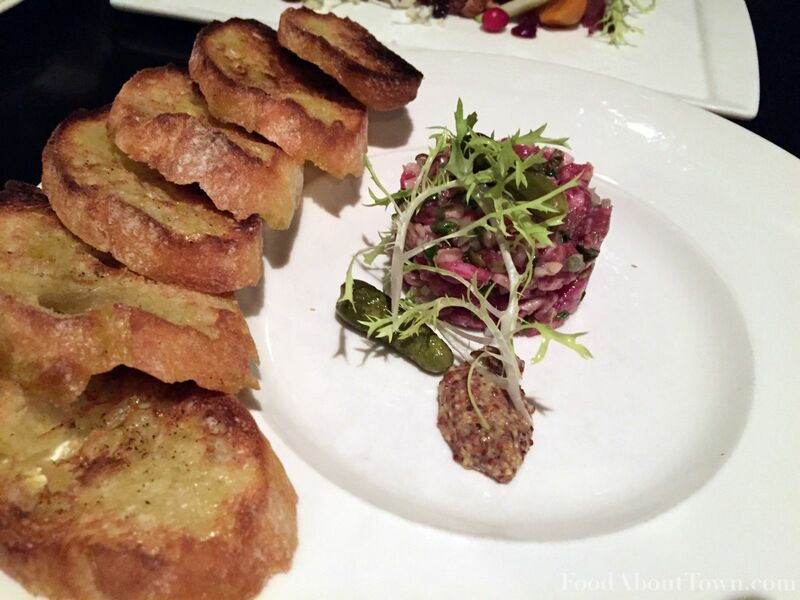 We started off with the roasted beet salad ($10) and wagyu beef tartare ($15). The baby beets were tender and I was pleased with the use of cranberry compote and Ewe’s bleu cheese as a way to distance itself from the straight traditional. Each complete bite brought the funk, sweetness, and bitterness. In the tartare, the beef was chopped slightly rough which worked both texture- and flavor-wise with the other minced sharper ingredients. The fat of the wagyu came through nicely and coated my mouth with rich beefiness. Two relatively simple dishes, executed well. We did sample the L.R.C. cocktail along with our first courses. Consisting of bourbon, an aperitif called Cynar, grapefruit, and aged orange bitters, the drink was mild upfront with pleasant bitterness and the alcohol hit at the finish. It was a nice match to our appetizers. 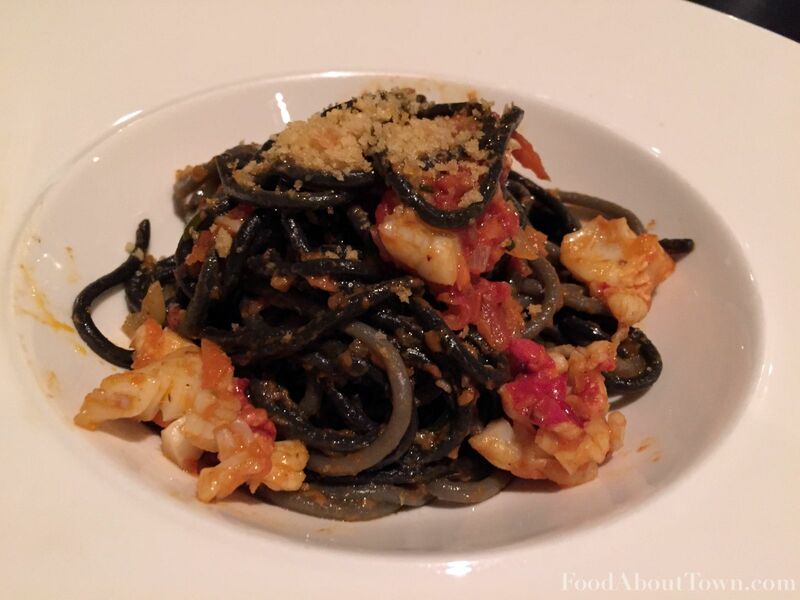 Swerving off the traditional path, the house-made squid ink spaghetti special ($18 for appetizer size) was a nice break from the richness. The background aroma of the sea was evident and was emphasized with pieces of crab and lobster. The pasta was just over al dente but was finished nicely with the light sauce that coated the noodles well. And now we’ll finally get back to the steak I mentioned at the top of the review: We decided on the 18-ounce bone-in prime NY Strip steak ($49) for our entrée which we had along with a side of Brussels sprouts. Our steak was cooked properly to medium rare, well-rested, and as tender as you’d expect prime meat to be. The only downside was that being cooked over live fire added some carbonizing on the crust that obfuscated some of the subtleties of the meat. That’s not to say that it wasn’t delicious because it most certainly was, but it’s something to be aware of when you pick which cut you’re ordering. The Brussels sprouts side with bacon ($7) was perfectly acceptable but nothing worth writing home about. 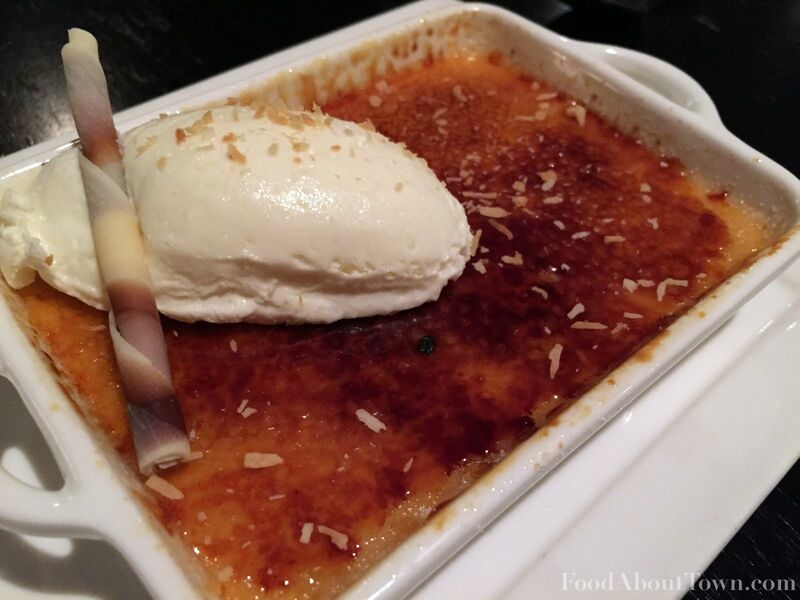 We topped off the night with a pumpkin-coconut crème brulee ($6) that thankfully didn’t overpower with the pumpkin spice. It was subtle and played well with the bittersweet crust on the smooth pudding that really did taste of pumpkin. A nice end to our meal and a good nod to the fall season. Char is a great fit, both as a hotel restaurant and in the Neighborhood of the Arts as a whole. Upscale style without too much pretension and food that stands up to the environment. Thankfully, the items I mentioned for lunch are also available at the bar during dinner time so even if you’re on a budget you can try what Char has to offer day or night.